Just as its name suggests, Villa Grand View offers spectacular vistas out to its lush surroundings. 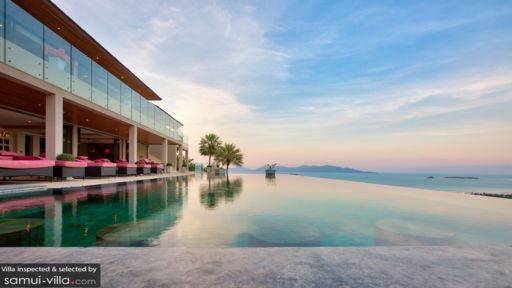 Perched atop the picturesque hills of Bophut, the villa is set in an excellent vantage point and looks out to the rugged mountains and azure seas. This luxurious hilltop retreat is stylish and contemporary, and is best suited for travelling parties of 10. Its capacious grounds and luxurious amenities makes it a great choice for hosting events and celebrations - from weddings and anniversaries, to corporate retreats. Each of the five bedrooms boasts king beds, air conditioners, safety boxes and mini fridges. Thai ornaments and artworks complete the interiors, lending the space an oriental charm. A private en suite, equipped with terrazzo bathtubs and rain shower alcoves extends out of each room. 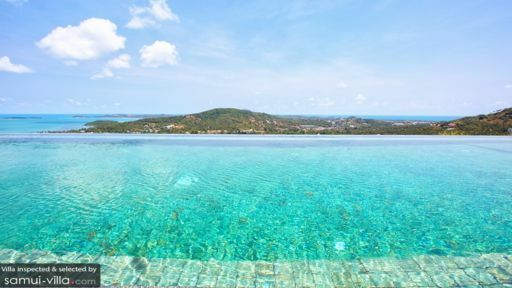 The 16-metre infinity pool sparkles under the sun. Hugging close to the edge of the outdoor compound, the pool serves as the central hangout, where vacationers enjoy refreshing dips and take in the scenic views. The poolside recliners and armchairs, along with a plush entertainment sala welcomes guests to sit back, unwind and soak up the laidback Samui vibes. The grounds of Villa Grand View are complete with waterfall features and a cactus garden. Embrace the best of tropical living in the airy semi-outdoor living spaces at Villa Grand View. The open-plan living spaces feature a fully equipped kitchen, capacious dining area furnished with a 12 seater and a cosy lounge outfitted with pillowy sofas and a coffee table. A digital mood lighting system lets you set the scene for chic dinner parties, movie marathon nights or an intimate post-dinner cocktail gathering. Villa Grand View is a full service property with three on-site staff. Housekeeping services and security services are included with your stay. Amenities available at additional cost include personal chef services, a daily breakfast service, personal driver services, vehicle rental, boat rental, laundry service, personal guest services and in-villa massages. Families will appreciate the availability of kid-friendly amenities like a baby cot, high chair and professional child minding services. The latter is available at additional cost. Villa Grand View puts holidaymakers within close proximity to the beach, as well as an array of shopping, dining, spa and cultural attractions in Bophut. Bophut beach is a 15-minute ride away, and there you’ll find plenty of seafront dining venues lining the coast. Pop by the Fisherman’s Village Plaza for souvenir shopping, or unwind with a Thai massage at Let’s Relax Spa. Must-see attractions for culture buffs include the Big Buddha and Mae Nam Chinese Temple. Both attractions are located a 15 to 20-minute drive from Villa Grand View.